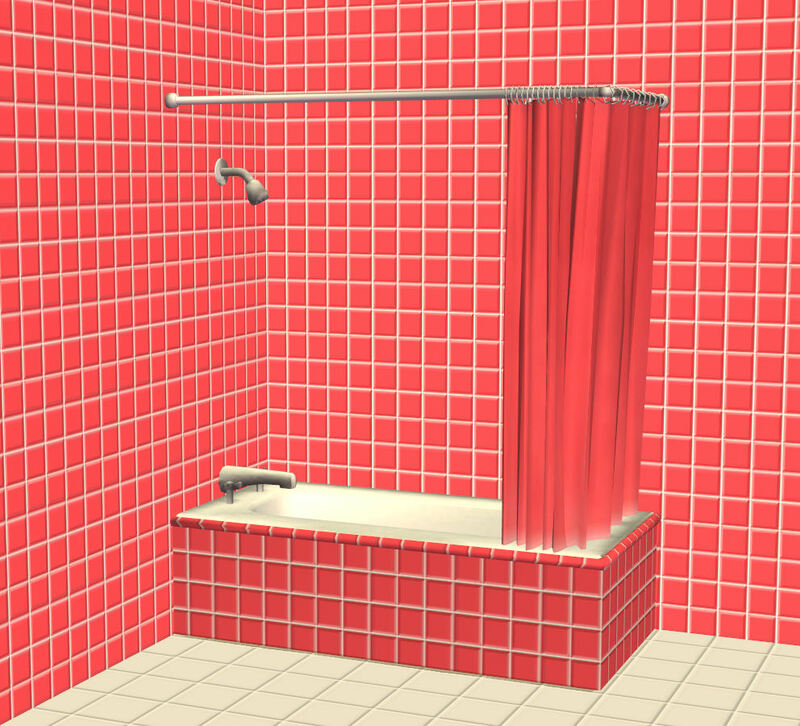 Traditionally, Sims used Bathrooms. These were all wrapped in, because it's cold in winter. 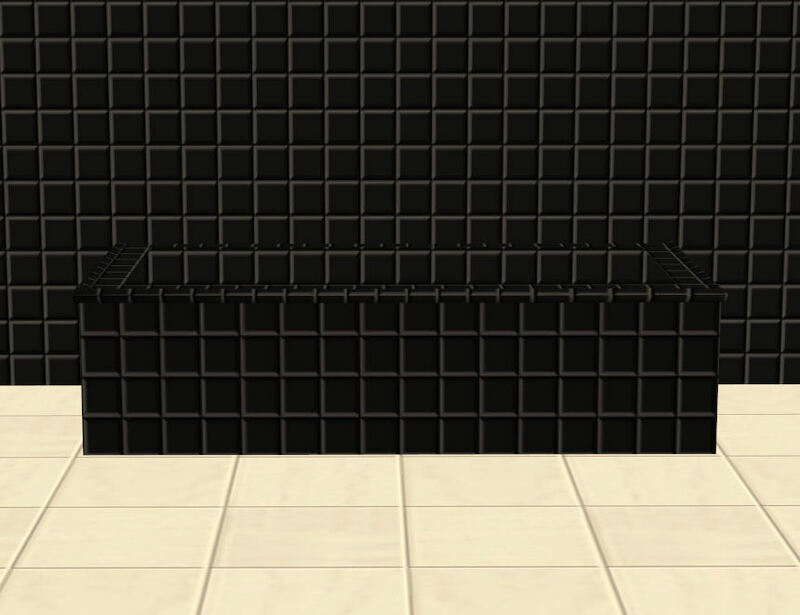 The Sims started to insulate their walls...and slowly but surely, replaced their 8 inch and a half padded walls with something thinner. 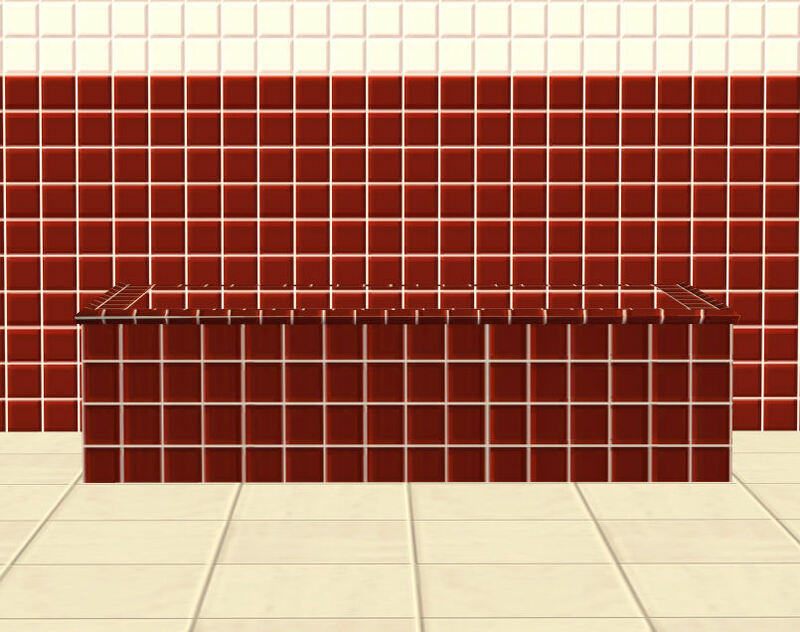 Sims had just discovered Ceramic! It's freaking cold, but better looking. 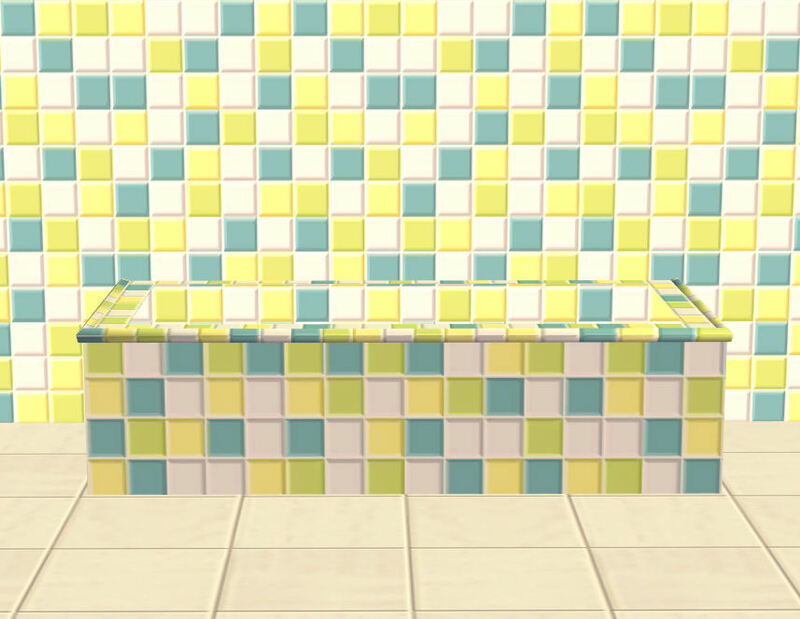 Here today, what I have for you are 3 new objects that are sure to enhance your Sim's bathrooms. 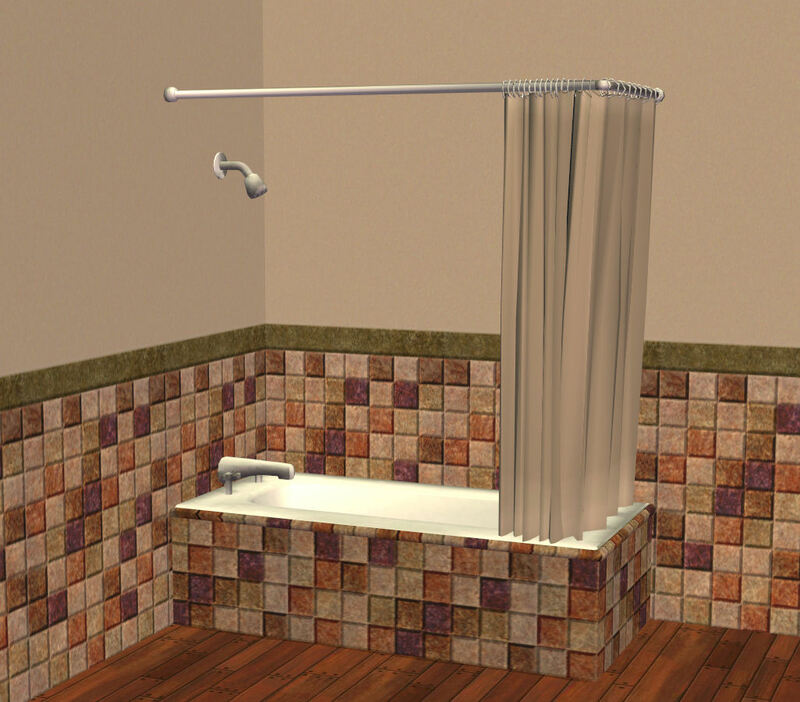 - A curtain accessory, to further cover any naked Sims. 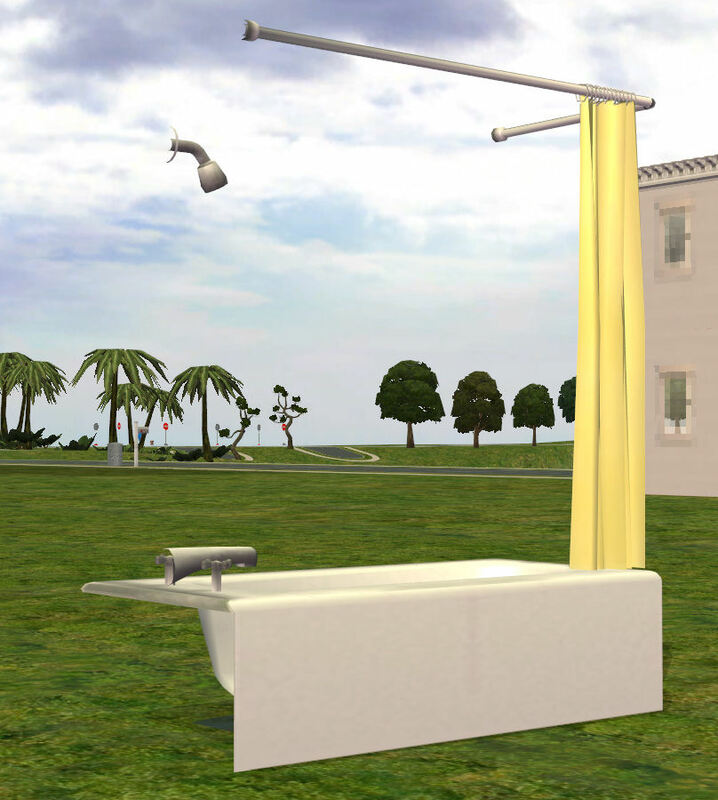 This backless ShowerTub is a bit special because you won't have to stuck it between 2 walls, if you don't want to. 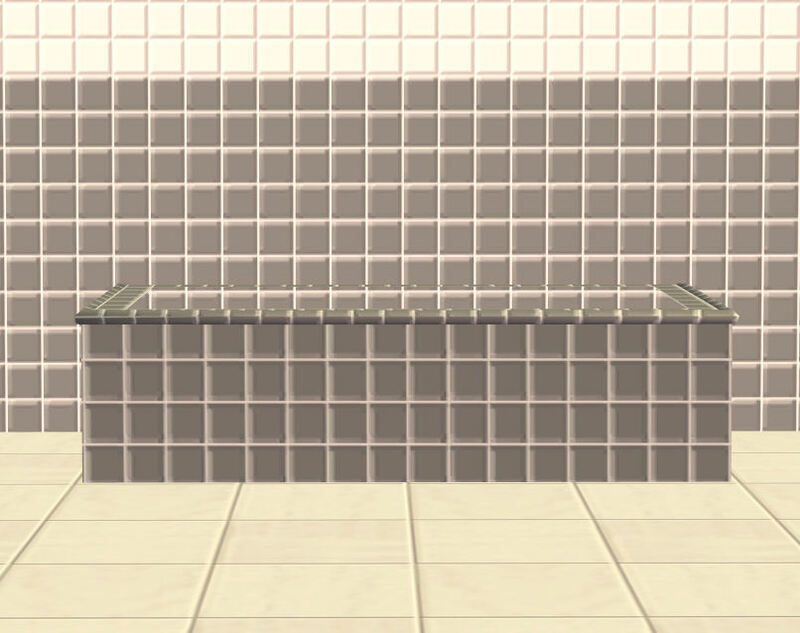 It makes it that you only need one wall, for all its plumbing needs. 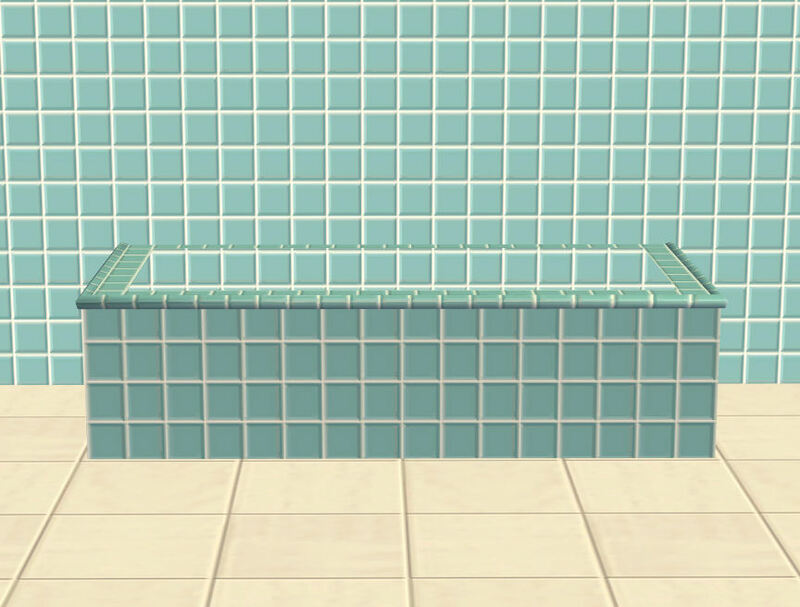 But without that second wall...your sims will be naked for everyone to see! 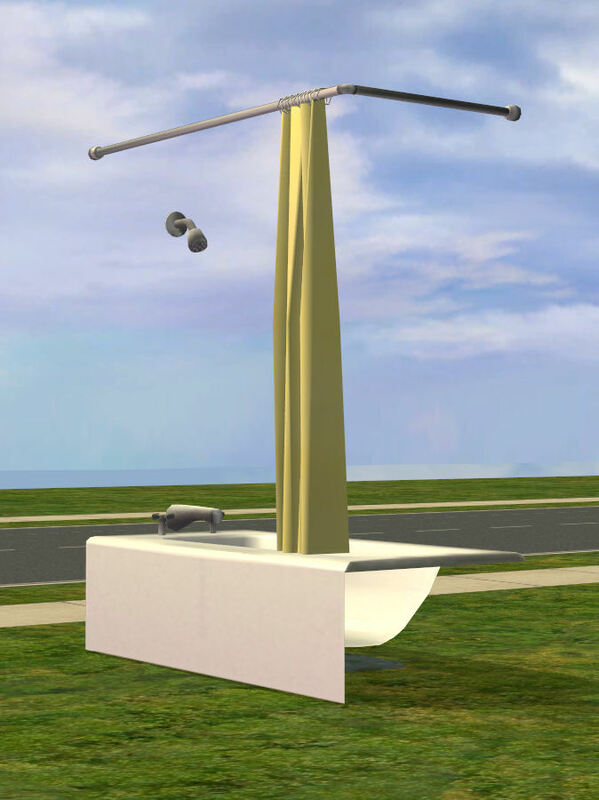 That is ok, there is a Curtain accessory placeable right there. Oh..That yellow casing? 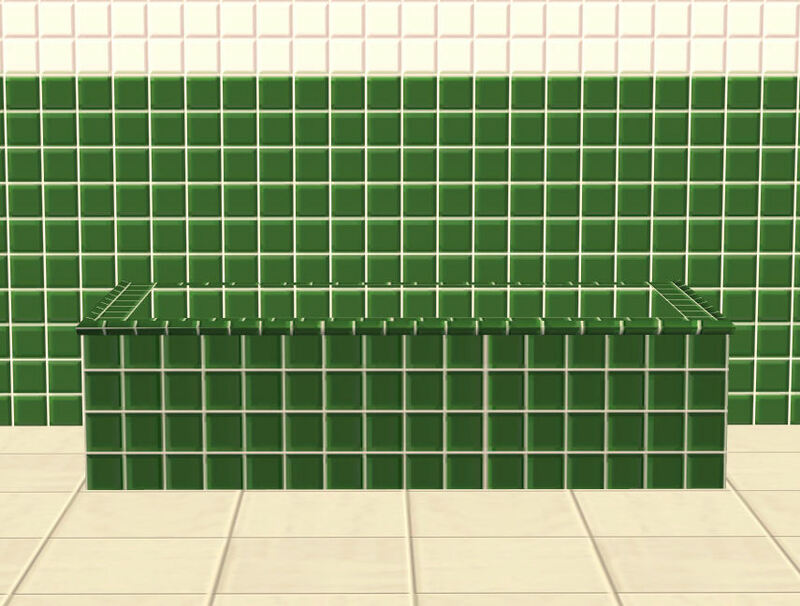 It is not only quite Traditional, but also useful to hide both sides of the backless tub! 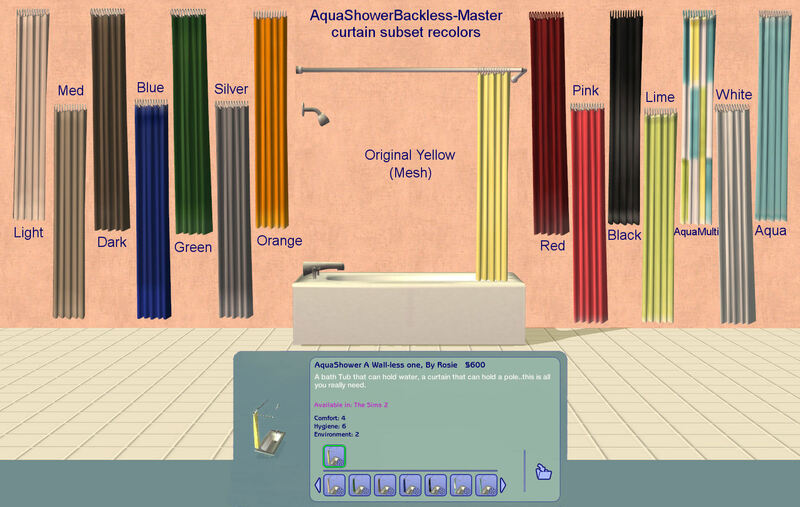 If you wish to recolor the Curtain Acc, recolor the master object's curtain subset. 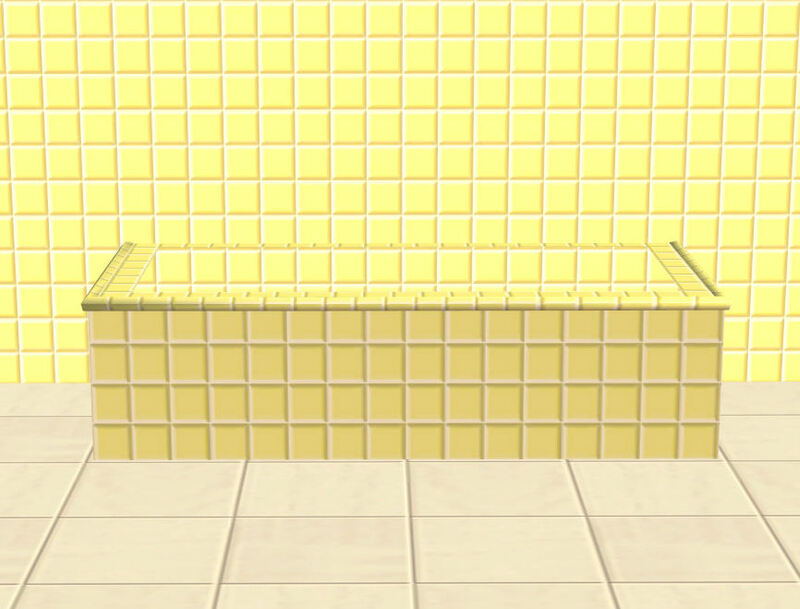 Bathtub is also recolorable, and its subset name is surfaces, but I have not provided any recolors for it. 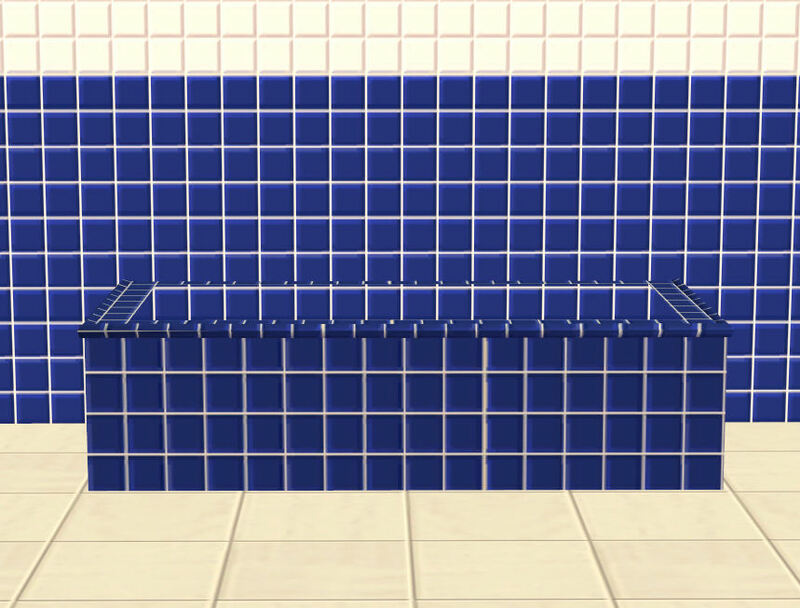 My tubs are white, what about yours? 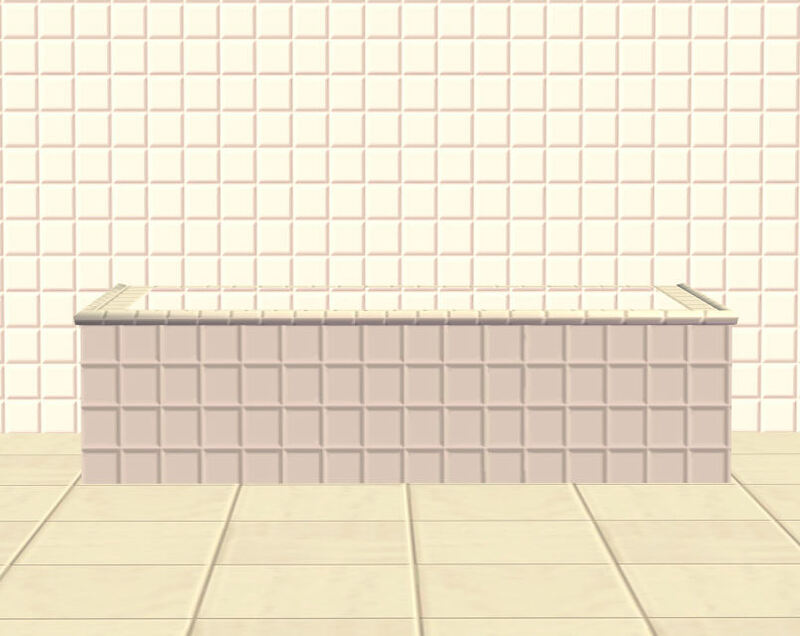 As for the bathtub casing, it is all alone and holds its own texture. If you wish to add to the recolors of the casing, do it. 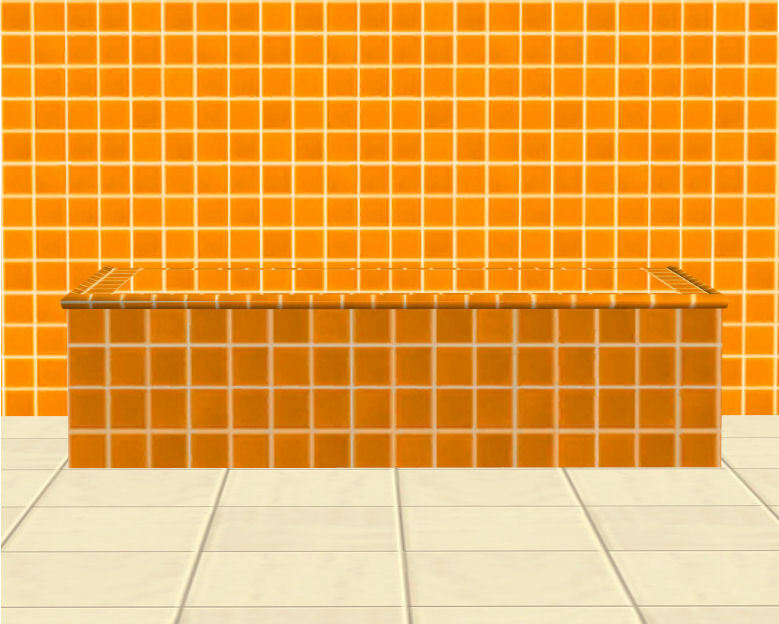 -Only the tub will get dirty, not the curtains. 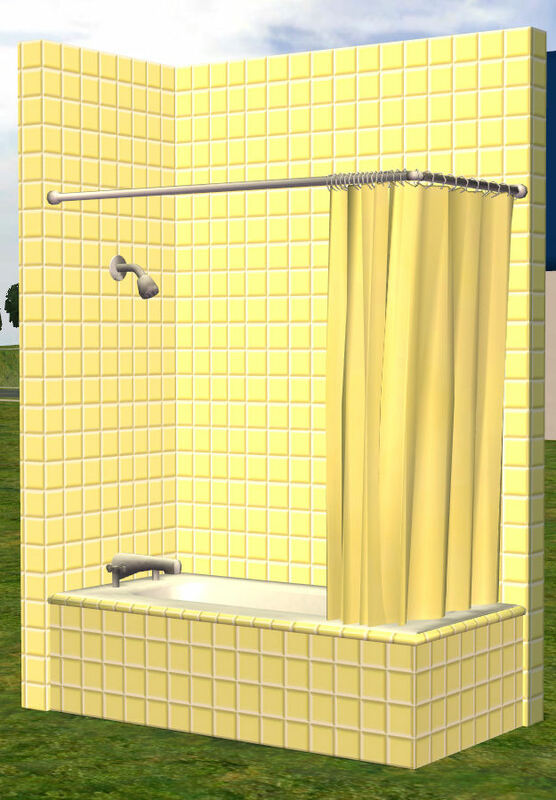 There is no animation in game, of a sim cleaning the curtain anyway. 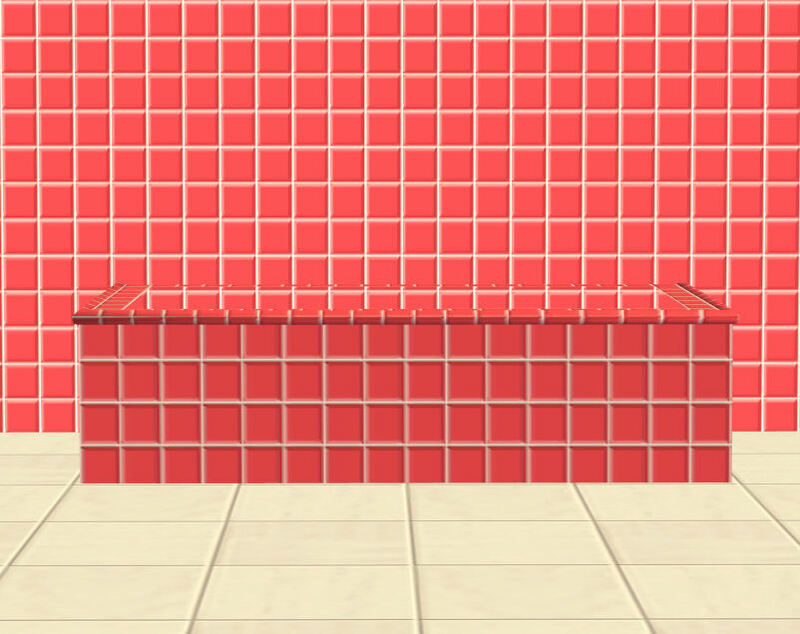 -You do not need moveobjects on to place any of this. 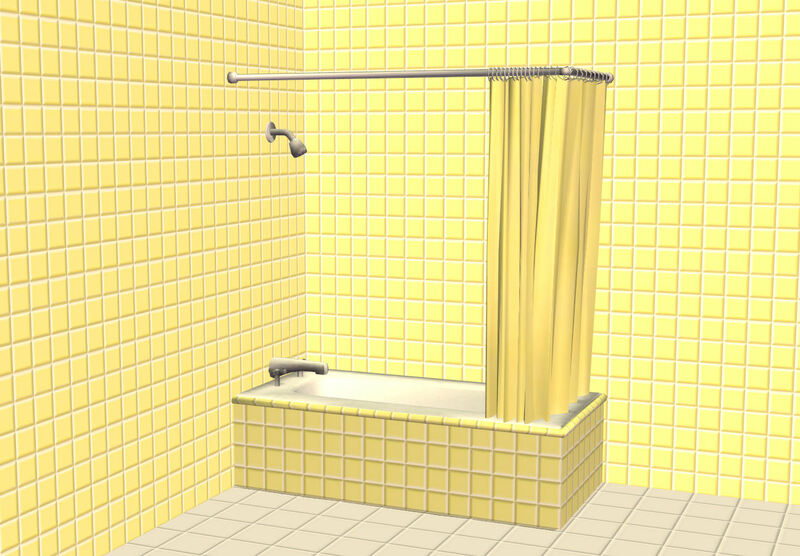 -All bathtub casing and Curtain Acc. 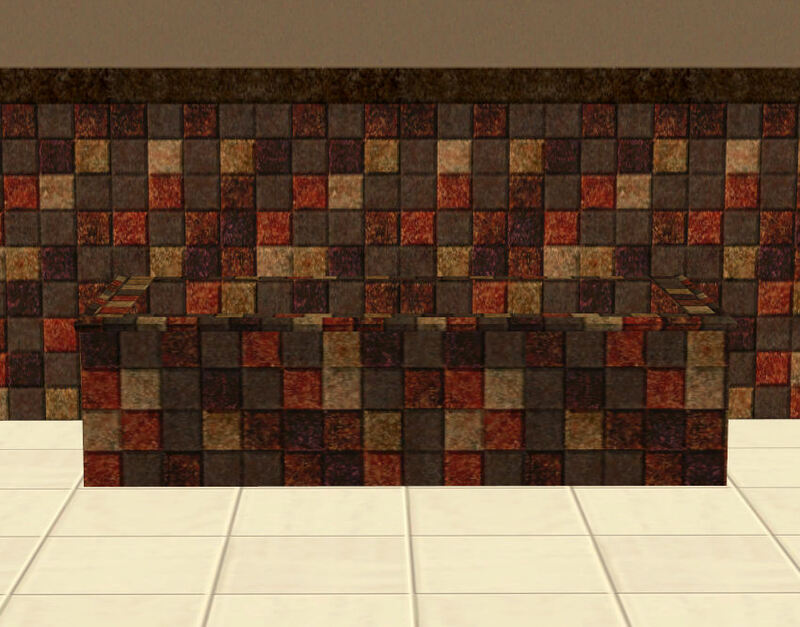 textures were made to match some of the game's walls, in Tile category. 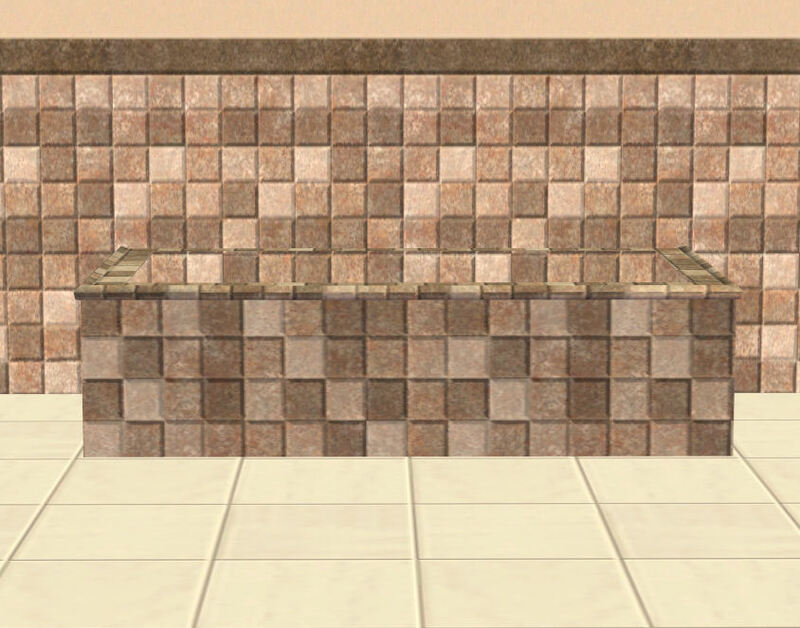 All the walls in that category that had the right size tile pattern have been used, for your convenience. This is 16 of them. -You can choose from 16 different colors. I wonder why? 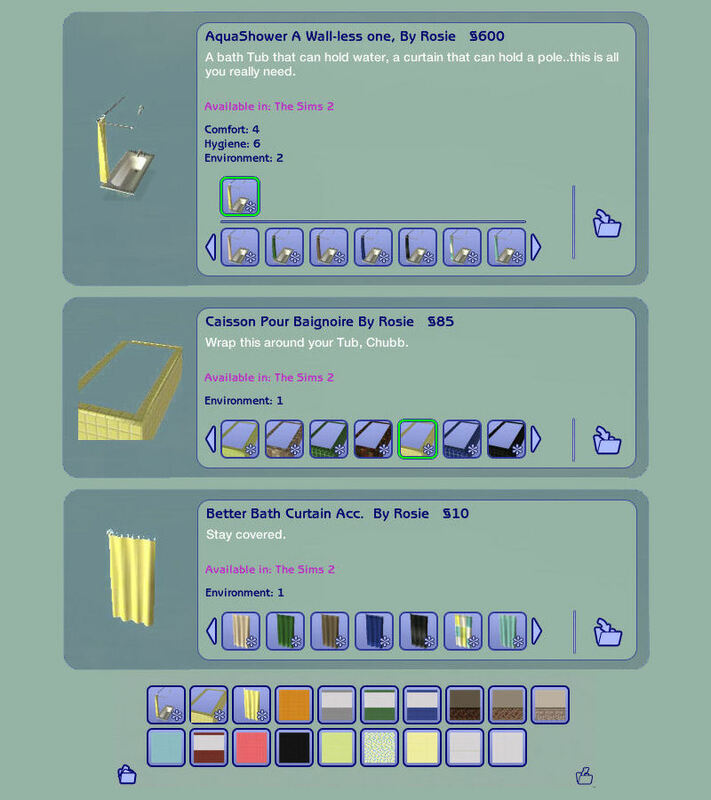 In addition to the 3 new objects, I added the 16 walls I used to make the recolors, into the Collection. You don't need to use them, but they will be easy to find if you choose to. 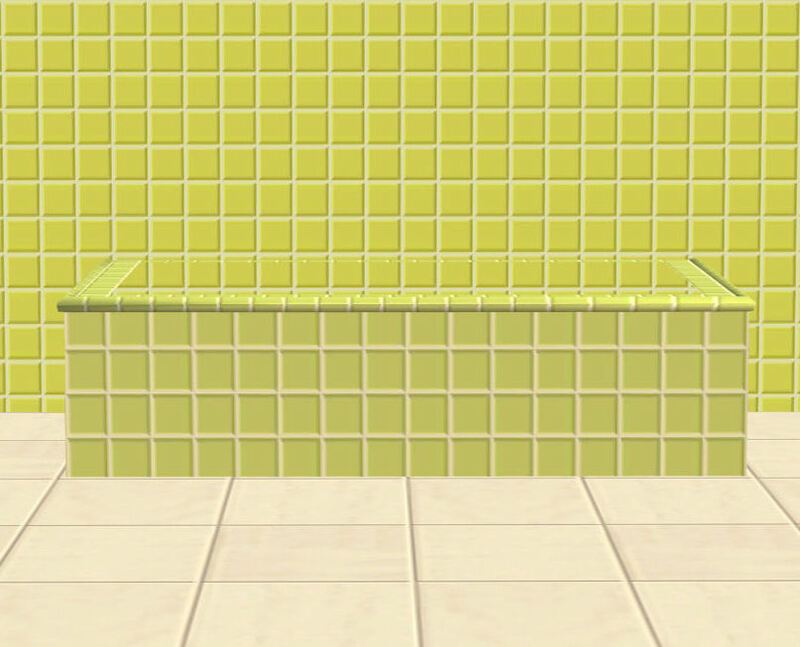 -The bathtub casing will also fit on all 3 rectangle shaped tubs, which includes the original walled-in shower. See for yourself, in the attached pictures. 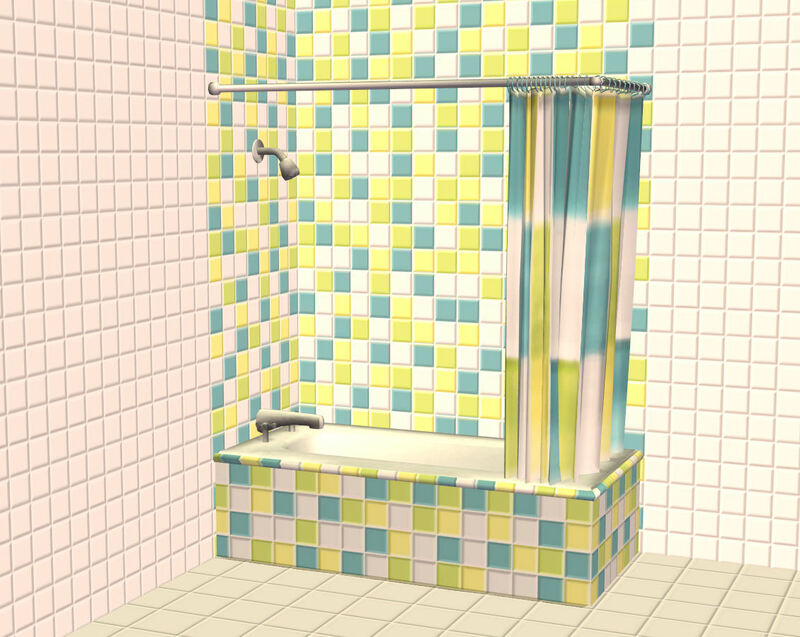 -I changed the Catalogue Thumbnail of the tub. 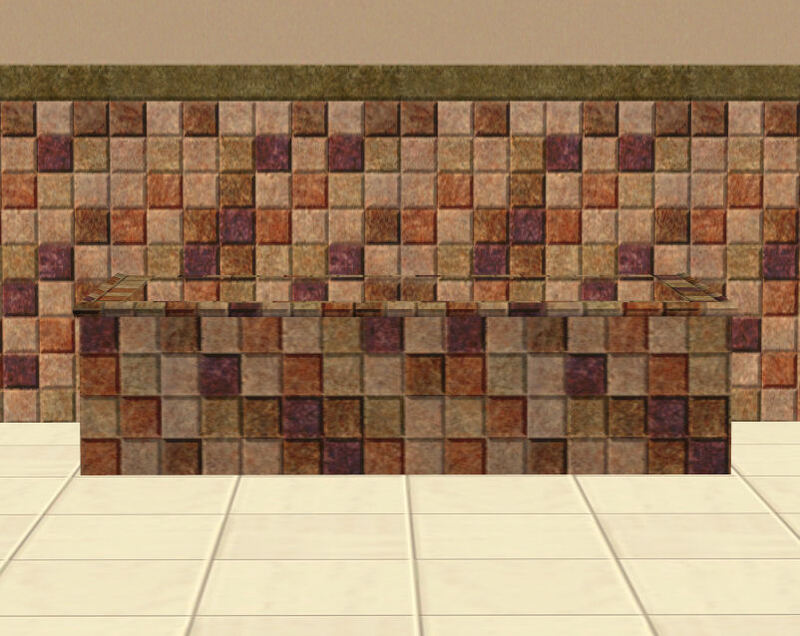 SimPE, MilkShape 3D, PaintShop Pro, The Compressorizer, EA!, MTS Forums, Creator's Feedback! 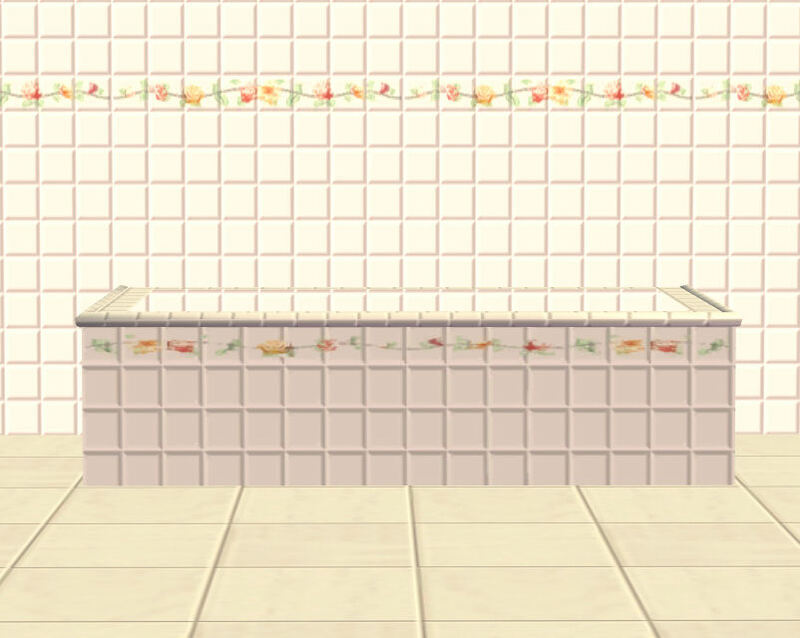 BathroomTraditional_By_Rosie.rar | Description: The Wole Set Is In There. CollectionFileAndIcon.rar | Description: A Custom Collection File And A Custom Icon To Go With It!